In powerful, lyrical language, here is the journey of Lewis and Clark told by themselves and their diverse crew — from a one-eyed French-Indian fiddler to Clark’s African-American slave; from Sacagawea to Lewis’s Newfoundland dog, a "seer" whose narrative resonates long after the book is closed. Allan Wolf is a member of the national touring company Poetry Alive!, and is able to recite hundreds of poems from memory. Perhaps it is unsurprising, then, that he chose to write this novel in poetic form. As he says, "During the four years it took to research and write NEW FOUND LAND, my head was constantly crowded with the novel's fourteen voices. They talked to me as I made breakfast, as I dressed the baby, as I delivered newspapers, and as I brushed my teeth. They talked and talked. Alone in my car I began to talk back. And together all fifteen of us worked out the details of the story. Happily, my head is now quiet, the voices having moved to their permanent home within this book." 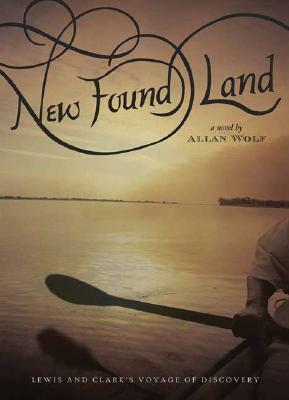 NEW FOUND LAND is Allan Wolf's first novel. and made to be their slave. at the place where three rivers become one. In times of war, we never left the camp unescorted. watched over my cousin and me. mashing pah-see-goo roots with a heavy stone. We were filled with hope. Spring had arrived. We would soon return to the plains to hunt the buffalo. Soon there would be skins to cover our tepees. Soon there would be meat to fill our stomachs. I was yet a young girl, but a strong one. Cousin was older and due to marry Split Feather soon. and their union was a blessing to our family. but not until I reached womanhood. Despite our hunger, Cousin and I were always laughing. She held her basket, filled with roots, against her stomach. "Look, Watches the Sky," she said, joking. "I am pregnant with many small children." Even serious Split Feather cracked a smile. Suddenly we heard the sound of the hawk. signaling to the tribe that the enemy was near. Every bird ceased its singing. My cousin and I fell silent too. We were still as the trees. the high whine of a flying arrow. The thud of arrow hitting flesh, cracking bone. his eyes were wide; he died instantly. his body had been river mist. into the woods at the far side of the creek. I remained crouching by the stream. Try as I might, I could not move. Split Feather slumped onto his horse. His eyes, open in death, watched me. His body slid to the ground. A Hidatsa warrior broke through the thicket. He sat high atop a white horse. In his left hand he held the rein. In his right hand he held a long battle club. Now bow your head — you are mine. I remembered the rock in my hand. I managed to hit him between the eyes. The warrior’s expression was fear and surprise. you could talk your way out of a hungry bear’s mouth. while I went to school to study the law. At least that’s what my mother thinks. as an apprentice at the Tarascon Brothers Shipyard. bound for the open ocean. Anybody can become a lawyer. I want to become something special. something that no one else can top. I want to read my story in the history books. and then he up and died just like that. Well, that’s not for me. that no other civilized man has yet seen. Well, that sounds like the boat George Shannon has been waiting for.